Youth leaders participate in a workshop offered by artist Coral del Mar Alemán. From left: Contemporary Artist Melquiades Rosario-Sastre; Catherine Ríos and Marianne Ramírez. Looking to contributing to generate changes in vulnerable communities and promote social transformation processes, 20 young people ages 13 to 18 from the communities of Santurce and Río Piedras participated in the “Young Leaders: Artistic Action for the Community” program. This edition of the educational program was the result of an alliance between FirstBank and the Puerto Rico Museum of Contemporary Art (MAC). The young participants received about 100 hours of workshops on collective art, cultural and environmental education, moving weekly to the communities. The program was directed by staff of the MAC Department of Education, with the participation of contemporary artists: Jaime Suárez, Roberto “Yiyo” Tirado, Melquiades Rosario-Sastre, Joudy Santaliz-Cuevas, Coral del Mar Alemán and Antonio González-Walker. 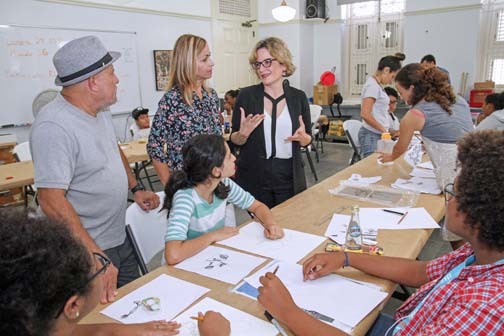 “We recognize the work done by the MAC for the young people and the communities in socio-economic disadvantage in Santurce and Río Piedras,” said Catherine Rios, official of FirstBank’s Community Reinvestment division. “Our donation gave young people the opportunity to participate in the program, and that they were exposed to knowledge that would allow them to stimulate their skills and creativity, which were reflected in the works they did in their communities,” she said. “In addition, we offered a talk on budget management so they know how to keep track of their expenses and income. Our goal is to offer young people opportunities to help them improve their quality of life,” added Ríos. During the program, participants worked with the artists on several projects, including the creation of a 40-foot mural in the Alto del Cabro community in Santurce, paintings depicting the arquitecture of Cerra Street, creating musical instruments from PVC pipes and tilemaking. “We focused several of our efforts on projecting outside the MAC’s headquarters the wide artistic, cultural and educational activity that characterizes it. Thanks to this permanent exercise, we managed to establish a very effective mechanism that articulates our different interdisciplinary projects with each other, to positively impact hundreds of residents of several areas of San Juan,” said Marianne Ramírez-Aponte, executive director of the MAC. The works created by the young people will be presented in an exhibition that will take place in the MAC Creative Area Gallery starting Aug. 4, under the auspices of FirstBank, the Joint Special Commission of Legislative Funds for Community Impact and Walmart Puerto Rico. Hey Buddy!, I found this information for you: "FirstBank, MAC promote arts among youth leaders". Here is the website link: https://newsismybusiness.com/firstbank-promote-leaders/. Thank you.